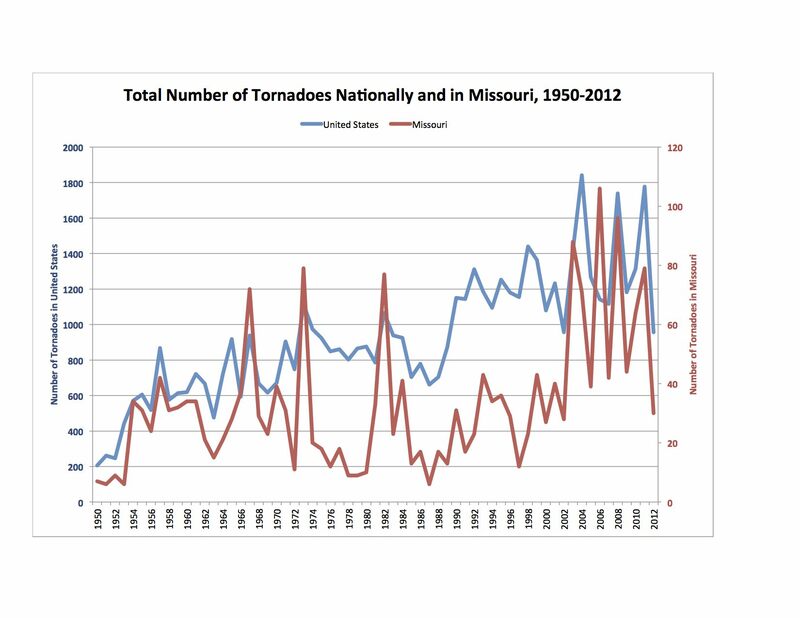 In my previous post, I discussed some statistics regarding tornado frequency in Missouri and surrounding states. In this post, I look at national and Missouri trends over time. Are tornadoes increasing in frequency, or are we just better at spotting them? Are they stronger and more destructive, or are we simply saturated with dramatic video from storm chasers? At first, it might appear that tornadoes have increased in frequency. The first graph at right shows the total number of tornadoes reported since 1950. The blue line shows the number reported nationally, and should be read on the left vertical axis. The red line shows the number reported in Missouri, and should be read on the right vertical axis. There is a lot of variation from year-to-year, but the trends increase dramatically. However, there are problems. Rain and temperature tend to occur over hundreds of square miles – they can be witnessed even in sparsely populated places, or by remote sensors. On the other hand, a tornado, and the damage it causes, are confined to the path of the tornado on the ground. To witness a tornado, it used to be that someone had to be right there – not likely in sparsely populated lands. Then they had to make a report, which might involve significant delay and travel over many miles. And finally, tornadoes can be hidden by darkness or rain. Thus, many tornadoes may have gone unwitnessed or unreported. Our ability to witness and report has increased dramatically over the years, however. First, land that used to be empty is empty no longer – more of the land is populated with potential witnesses. Second, cell phones and the Internet greatly increase our ability to report tornadoes. And finally, the National Weather Service has deployed doppler radar, which now covers most of the country. Even tornadoes that escape human witness are seen by the radar. Consequently, many tornado experts believe that tornadoes have not increased dramatically in frequency, but rather, our ability to detect them has improved. Scientists believe that the weakest of tornadoes are the ones most likely to have escaped detection in the past. So one way of trying to determine if the increase comes from more tornadoes or better detection would be to eliminate the weakest ones from the count, the F-0 tornadoes. 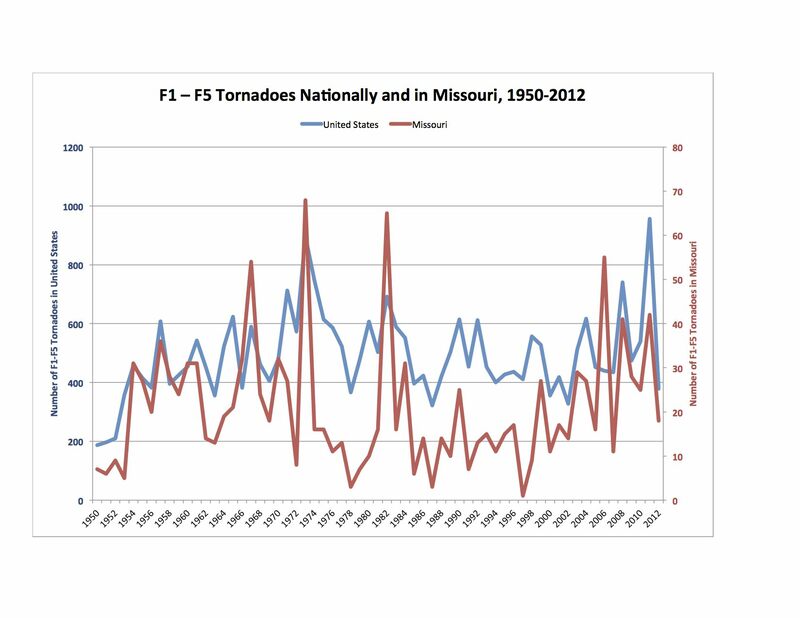 The second graph at right shows the number of F-1 to F-5 tornadoes, again with the national numbers on the left vertical axis in blue, and the Missouri numbers on the right vertical axis in red. As before, there is tremendous variation from year-to-year. But this time, the overall trends do not appear to be dramatically increasing, they appears to be rather flat. Thus, it appears that tornadoes are not really increasing in frequency. Rather, our improving ability to detect them seems to be making them seem more frequent. Storm Prediction Center WCM Page, National Storm Prediction Center, NOAA, http://www.spc.noaa.gov/wcm/#enso. By mogreenstats in Air, Climate Change, Weather Patterns on 2013/06/29 .